In contrast to the bright morning about to dawn over Portsmouth, England, on June 4, 1944, gloom settled over the Allied commanders gathered inside Southwick House at 4:15 a.m. Years of preparation had been invested in the invasion of Normandy, but now, just hours before the launch of D-Day operations, came the voice of Group Captain James Stagg urging a last-minute delay. 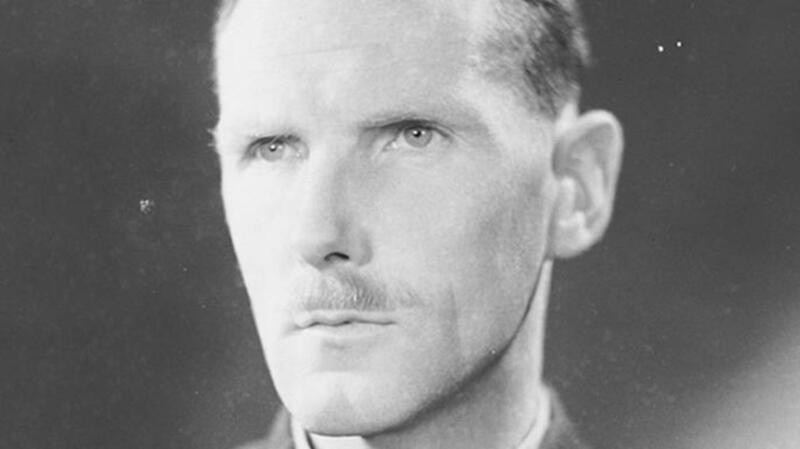 As Operation Overlord’s chief meteorological officer, the lanky Brit was hardly a battlefield commander, but the ultimate fate of D-Day now rested in his decision-making. 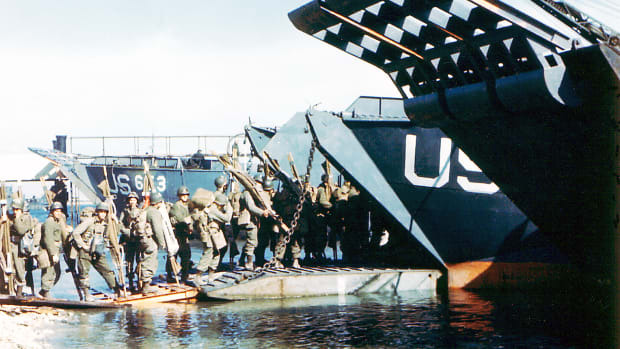 Allied troops packed tightly into an aquatic landing craft wait for their turn to face the Germans at Normandy. The disappointed commanders knew that the list of potential invasion dates were only a precious few because of the need for a full moon to illuminate obstacles and landing places for gliders and for a low tide at dawn to expose the elaborate underwater defenses installed by the Germans. 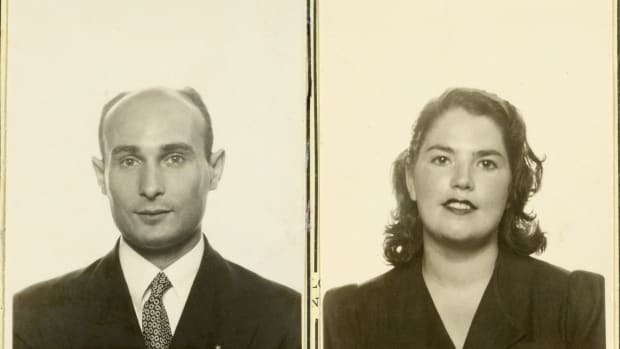 June 5, chosen by Allied Supreme Commander Dwight Eisenhower to be D-Day, was the first date in a narrow three-day window with the necessary astronomical conditions. 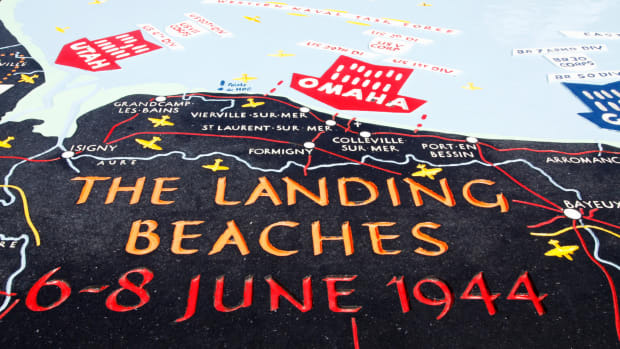 The massive Normandy landings, however, also required optimal weather conditions. High winds and rough seas could capsize landing craft and sabotage the amphibious assault; wet weather could bog down the army and thick cloud cover could obscure the necessary air support. The critical, but unenviable task of predicting the English Channel’s notoriously fickle weather fell to a team of forecasters from the Royal Navy, British Meteorological Office and U.S. Strategic and Tactical Air Force, and as D-Day approached, storm clouds brewed inside the meteorological office. Observations from Newfoundland taken on May 29 reported changing conditions that might arrive by the proposed invasion date. Based on their knowledge of English Channel weather and observations, the British forecasters predicted the stormy weather would indeed arrive on June 5. The American meteorologists, relying on a differing forecasting method based on historic weather maps, instead believed that a wedge of high pressure would deflect the advancing storm front and provide clear, sunny skies over the English Channel. In the early hours of June 4, Stagg believed foul weather was only hours away. He sided with his fellow British colleagues and recommended a postponement. 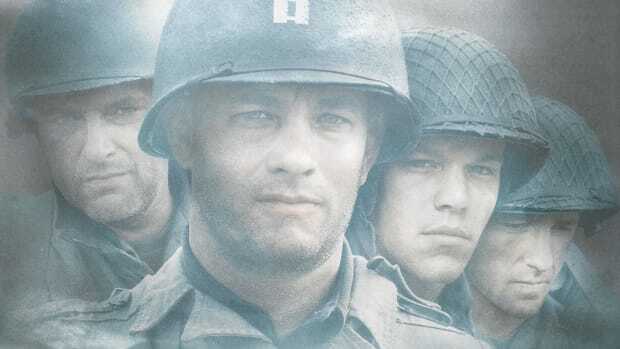 Knowing that the weather held the potential to be an even fiercer foe than the Nazis, a reluctant Eisenhower agreed in the early hours of June 4 to delay D-Day by 24 hours. On the other side of the English Channel, German forecasters also predicted the stormy conditions that indeed rolled in as Stagg and his fellow Brits had feared. The Luftwaffe’s chief meteorologist, however, went further in reporting that rough seas and gale-force winds were unlikely to weaken until mid-June. 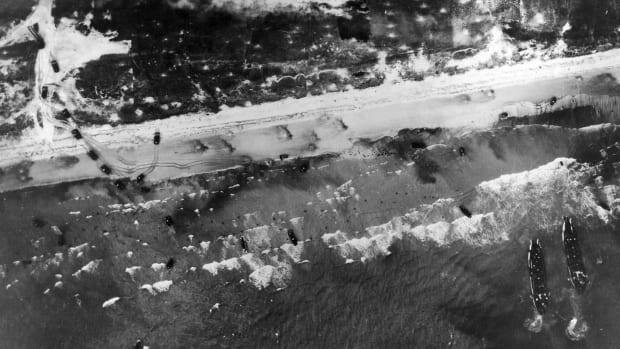 Armed with that forecast, Nazi commanders thought it impossible that an Allied invasion was imminent, and many left their coastal defenses to participate in nearby war games. German Field Marshal Erwin Rommel even returned home to personally present a pair of Parisian shoes to his wife as a birthday present. German Luftwaffe meteorologists, however, relied on less sophisticated data and models than their Allied counterparts, says John Ross, author of “The Forecast for D-Day: And the Weatherman behind Ike’s Greatest Gamble.” “The Allies had a much more robust network of weather stations in Canada, Greenland and Iceland; of weather ships and weather flights over the North Atlantic and observations by secret agreement from weather stations in the neutral Republic of Ireland,” he says. Those weather stations, in particular one at a post office at Blacksod Point in the far west of Ireland, proved crucial in detecting the arrival of a lull in the storms that Stagg and his colleagues believed would allow for an invasion on June 6. As rain and high winds lashed Portsmouth on the night of June 4, Stagg informed Eisenhower of the forecast for a temporary break. With the next available date for an invasion nearly two weeks away, the Allies risked losing the element of surprise if they waited. In spite of the pelting rain and howling winds outside, Eisenhower placed his faith in his forecasters and gave the go-ahead for D-Day. 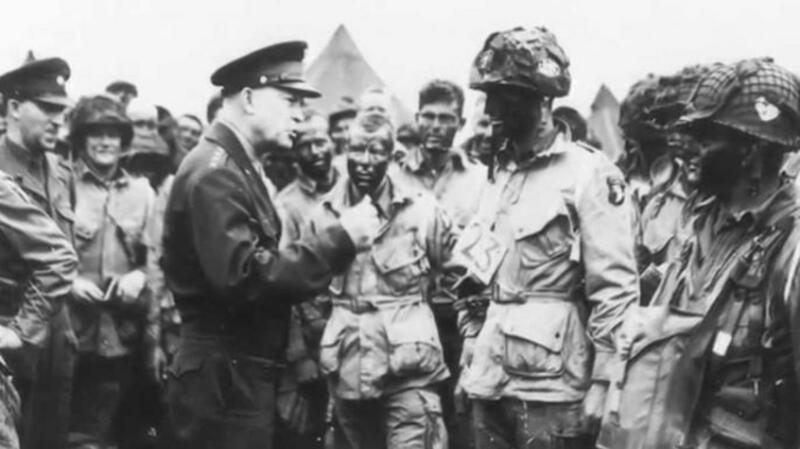 Allied Supreme Commander Dwight Eisenhower speaking with troops before the invasion of Normandy. 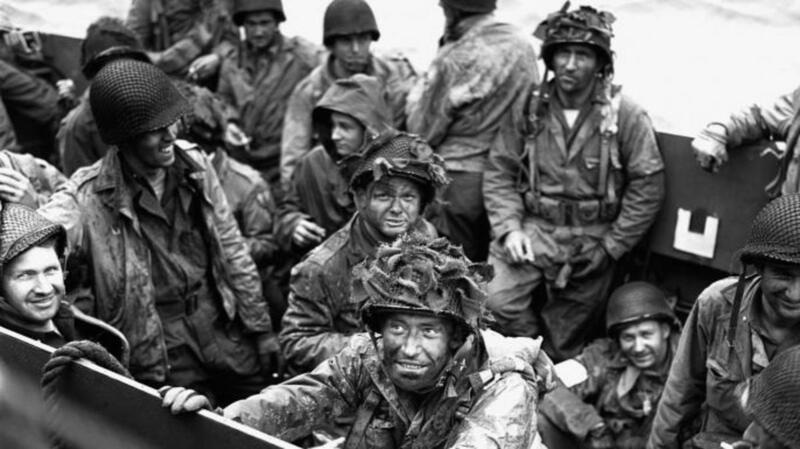 The weather during the initial hours of D-Day was still not ideal. Thick clouds resulted in Allied bombs and paratroopers landing miles off target. Rough seas caused landing craft to capsize and mortar shells to land off the mark. By noon, however, the weather had cleared and Stagg’s forecast had been validated. The Germans had been caught by surprise, and the tide of World War II began to turn. 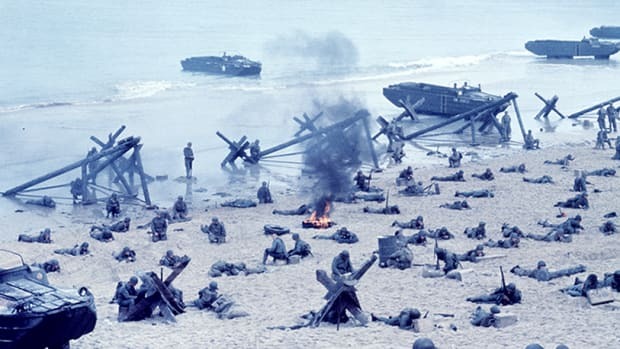 Weeks later, Stagg sent Eisenhower a memo noting that had D-Day been pushed to later in June, the Allies would have encountered the worst weather in the English Channel in two decades. “I thank the Gods of War we went when we did,” Eisenhower scribbled on the report. He could also have been thankful for Stagg overruling the advice of the American meteorologists who wanted to go on June 5 as planned, which Ross says would have been a disaster.